Signal tower by the looks. Totenruf-Warte translates very roughly as something like 'the dead call waits'. The rest of it says something about a 'tower of malice'. 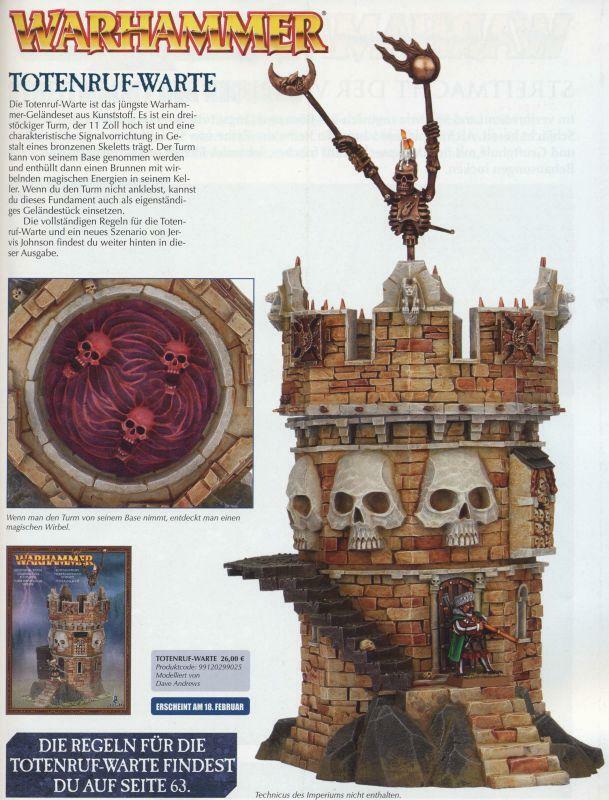 Games Workshop design brief: "Okay guys, I'm thinking of skulls, skulls and skulls. I mean who honestly doesn't love skulls. The look worked for Skeletor, the Red Skull and Ghost Rider. C'mon...Skulls are badass right?" Yeah its some form of Watchtower/signaltower, the thing on the top being the signaling thing. This gets another resounding meh from me, like most of the recent Fantasy terrain tbh. Its not even a new fortress to support the siege rules. I'm such a fanboy, I really seriously do drink the coolaid. I like it! Good alternative to Skullvane Manse. If you look closely, it's pretty much the same bits as the Manse tower option, and for cheaper. So if you wanted to buy the tower option of the Manse separately you can. Quite funny how SV was all the rage but this one is not so much even though it's the same bits? Its nice, but not really exciting or new in any way... Just one of the previous towers with some different bits. 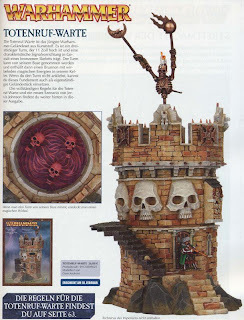 What I would give for some Skull-less terrain though!